The month of March begins in a big way this year with the annual New Creations Festival presented by the Toronto Symphony. In last month’s issue I introduced the main features of what is being planned for the three concerts happening on March 5, 9 and 12, including the presence of guest composer, conductor, violist and co-curator Brett Dean from Australia. One of the three commissioned works for this year’s festival is a unique collaboration between composer Paul Frehner and filmmaker Peter Mettler. I had an opportunity to speak with both of these creators to find out how their piece for orchestra and film came into being and what we can expect to experience on March 9, the night of the performance. I began by asking Frehner how the commission came to be and wondered if the two artists had worked together before. As it turned out, the project began when Frehner was approached by Gary Kulesha on behalf of the TSO with a request to be involved in the writing of a work for orchestra and film. According to Frehner, Mettler was then approached on a recommendation from film director Atom Egoyan. The two artists had never met before, so right from the beginning, they started with a dialogue that involved examples of each other’s work being sent back and forth, and engaging in conversations exploring various ideas that each were drawn to. Writing music for film often takes a predictable path, where the composer writes to a set sequence of images. Not so with the way Mettler works. He has spent the last 12 years developing software that functions as an instrument for editing and mixing both image and sound to create a film “on the spot.” He can use this instrument to both improvise and create, providing a personal challenge that is “far more exciting than just pushing play.” In the early stages of their collaboration, Mettler sent Frehner up to 90 minutes of raw footage, some of which were extended sequences. Frehner latched onto a few of these and wrote music inspired by those scenes. Using music software to create an orchestral rendering of the music, Frehner sent his sketches back to Mettler, who then began to improvise using his bank of 2000 or more images, finding visual complements to what the music was doing. Gradually a shape began to emerge as the dynamic exchange continued and in the end, many of the image sequences that Mettler chose were not related to those that Frehner was originally inspired to write music for. In their initial dialogues, they discovered that they shared a mutual interest in science and physics. Beginning with conversations on particle physics, they eventually decided to focus the piece on ideas of cyclical rotation – orbits, tidal rhythms, and natural cycles, ending up with the title From the Vortex Perspective. Structurally, the music has both cyclical elements and abrupt changes. Several ideas return, each time with variations in orchestration. Frehner’s compositional style can be described as eclectic, integrating such influences as Brit and American rock, jazz pianists Oscar Peterson and Keith Jarrett, early music, as well as the music of a range of composers including Grisey, Vivier and Nancarrow. In this project with Mettler, Frehner chose to feature the brass instruments prominently in various places, incorporating unison writing and the low register instruments. In other places, the string section has the main idea, whereas at other times, strings provide a textural background. Visually, the film begins with images of an abstracted forest environment, moving into reflections on water. At one point when the music becomes heavily punctuated, the viewer is taken through a sequence of different grasses and reeds with the sunlight bursting through to create complementary accents. Some of the slowly evolving scenes created opportunities for Frehner to linger longer with some of his musical ideas, taking his time to explore them rather than looking for other directions. For the performance, the images will be projected onto three screens – two smaller monitors surrounded by a larger screen, with the spatial aspect of the three image sources becoming an aspect of the overall composition. And just as the conductor and musicians interpret the musical score, Mettler has created his own guiding score as an aid for his real-time performance during which he will respond to the subtleties of the music to create a live version of the film. Thus this work is a true performance in both mediums of image and sound. As mentioned above, Brett Dean is this year’s guest of the New Creations Festival. As it turns out, Frehner and Dean crossed paths over ten years ago on two different occasions – in 2002 at the Winnipeg New Music Festival where Dean was the featured composer and Frehner had a composition; and a few years later at the Malaysian Philharmonic Orchestra’s International Composers Competition where Dean was the judge and Frehner was one of the composers present. Dean’s role as curator for the New Creations Festival includes the programming of three of his own works, each substantial pieces for orchestra, as well as works by fellow Australians Anthony Pateras and James Ledger. New Music for Orchestra: The New Creations Festival is not the only chance to hear new orchestral work this next month. The Toronto Symphony will perform works by three Canadian composers: “Home” from New World by Michael Oesterle on March 31, Alligator Pie by Abigail Richardson-Schulte on April 2 in matinee performances, and Ringelspiel by Ana Sokolović, performed by the evening’s guest performers – the National Arts Centre Orchestra – on April 2. On March 31, Esprit Orchestra teams up with the Elmer Iseler Singers for their last concert of the season to perform two newly commissioned works with mythic themes: Soul and Psyche for choir and orchestra, composed by Esprit’s founder and conductor Alex Pauk, and Sirens by Canadian Douglas Schmidt. The program also includes Hussein Janmohamed’s choral work Nur: Reflections on Light, which weaves together Ismaili Muslim melodies, Quranic recitation and Indian ragas, and the classic orchestral dance score La création du monde by Darius Milhaud, infamous for its combination of jazz and classical rhythms from the early 1920s. Soundstreams: Soundstreams is cooking this month with several events. Starting off in early March, they will present three concerts of the music of Scottish composer James MacMillan in three cites: Kingston (March 4), Kitchener (March 6) and Toronto (March 8). 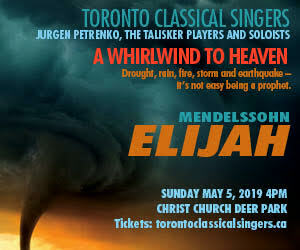 The program will highlight MacMillan’s masterpiece, Seven Last Words from the Cross, as well as selections from Schafer’s The Fall into Light. The Toronto concert will include additional works by MacMillan (The Gallant Weaver) and Schafer (In Memoriam Alberto Guerrero), along with a performance of James Rolfe’s When Lilacs Last in the Dooryard Bloom’d, a Soundstreams commission from 2006 based on Walt Whitmans’s elegy written after the assassination of U.S. President Abraham Lincoln. Then in mid-month, Soundstreams will kick off a series of events being planned to celebrate the 80th birthday of minimalist pioneer Steve Reich culminating in a gala concert on April 14. Getting the ball rolling will be their second Ear Candy event on March 19 featuring Reich’s first major work It’s Gonna Rain, created from a surprise discovery made while fiddling about with out-of-sync tape loops. The phasing technique he developed from these experiments paved the way for the birth of his minimalist aesthetic. It’s also an opportunity to hear his Electric Counterpoint which has been recorded by such artists as Radiohead’s Jonny Greenwood, whose Water will have its Canadian premiere in the New Creations Festival on March 12. The Ear Candy evening also features a diverse array of local artists, each of whom has been influenced by the minimalist aesthetic. Four of these performers, including DJ SlowPitchSound and Brandon Valdivia, will also be performing the previous evening on March 18 at the Soundstreams’ Salon 21, which offers a historical look at the development of minimalism. Music Gallery: The performance of Reich’s music continues over at the Music Gallery in a concert on March 17 featuring composer and performer Michael Century. In his earlier days, Century founded The Banff Centre for the Arts Media Arts program in 1988, a program that helped initiate new media practice in Canada. In this concert, Century will perform Reich’s Piano Counterpoint, an arrangement for solo piano and tape of Reich’s classic Six Pianos, as well as premieres of his own works for piano, accordion and live electronics. These works use open software and an eight-channel immersive speaker array. Additional pieces by American composers Julia Wolfe, John Cage and Morton Feldman will be heard in the second half of the evening. The Music Gallery continues to mark their 40-year history with an installation and listening salon opening on March 11 celebrating their partnership with Musicworks Magazine. The magazine has a long tradition of including recordings with their print issues, first released as cassettes and now as CDs. Past and present editors and contributors to the cassette legacy will be speaking of their memories and experiences at the opening event. New Music Concerts: New Music Concerts is also busy with two upcoming concerts. On March 11 (in Kitchener) and March 13 (in Toronto) in a co-presentation with the Music Gallery, the Quasar Saxophone Quartet performs music by five Quebecois composers writing for saxophone quartet and electronics, including video in one of the works. The quartet is dedicated to the creation of contemporary works with their interests ranging from instrumental music to improvisation and electronics. On April 3, the electronic theme continues with their concert entitled Viva Electronica. It will be an evening of three world premieres, all of them NMC commissions from composers Anthony Tan, Keith Hamel and Paul Steenhuisen. Each of these artists has done significant research in the world of electronics, live electroacoustics and music software programming, as well as taught the ins and outs of working with music technology at various universities. Mar 6: John Laing Singers perform works by Glen Buhr and Eric Whitacre. Mar 6: Junction Trio hosts Schola Magdalena performing works by Stephanie Martin. Mar 10: Canadian Music Centre; “Truth North Stories” with piano works by Anhalt and Morawetz. Mar 18 Canadian Music Centre; “Canadian Art Song Showcase” with works by Alice Ho, John Beckwith, Sylvia Rickard and Hiroki Tsurumoto. Apr 2: Nagata Shachu with TorQ, performing works for Japanese, Western and world percussion.